Dad's Army had been running for four successful years by the time It Aint Half Hot Mum hit our screens. 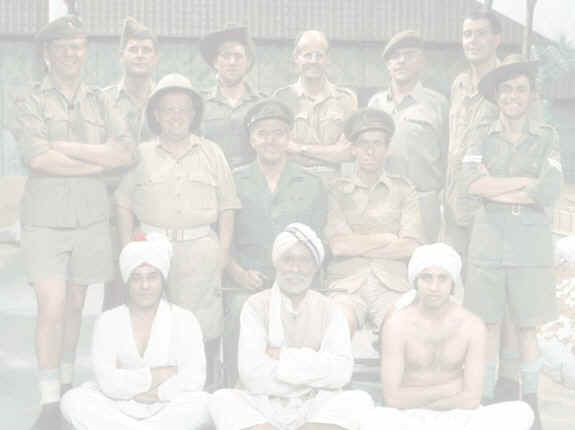 The programme was set in India during the Second World War and was mainly based on Jimmy Perrys days with the Royal Artillary Concert Party, though David Croft had also served in India and the set was based on one of the sites David had actually been in. Today there would be no problem, but back in the early 1970s there wasn't many Asian actors available, so the part of Rangi Ram, the Bearer was a major headache for Jimmy and David. It so happened that Jimmy knew the actor Michael Bates, who had been born in India. He had also served with the Gurkhas during the war and spoke the language. The choice was an inspired one and Michael was a main part of the series until his untimely death from cancer, after Series 5 was broadcast the series carried on for 3 more seasons, but with a gap where Michael had been. Another problem for Jimmy and David was the role of the Sergeant -Major. They originally sent the script to Leonard Rossiter who went to see them. Overall they found his attitude quite patronising, he claimed the character fell into the trap of being a cliche, and after discussions, bade him farewell. They next met Windsor Davies whom David Croft had seen in a police series and read the part as a Welshman, which he was, and the part fitted him perfectly. He also had a fine, untrained bass-baritone voice and together with Don Estelle who played Lofty in the series and whom had a lovely tenor voice, they hit the Number One spot on the charts with "Whispering Grass", which showed how popular the series had become. Again the title theme was written by Jimmy and Derek Taverner, but this time was performed by the cast themselves, as the concert party.